Over the past month I’ve done a significant amount of testing with the UStream service. From standing up an emergency live stream of robot football….yes, I said robot football. To Notre Dame Commencement and a national chamber music competition. The robot football UStream was in response to a system admin enabling a firewall on our Windows Media encoder and tanking our service. Anyhow, that qualifies as our first successful production UStream, even with the crazy path it took. A microwave link from Stepan Center to the Hesburgh Library, back to WNDU on fiber, then on to cable TV channel 13 (via Comcast in Mishawaka). Finally, pulled it off my Comacst DCT, through a Canopus and into a Mac Mini. Next came the Fischoff National Chamber Music Competition on Mother’s Day, there’s another story here too. Due to a conflict with live streaming our Mass from the Basilica that day, I decided to give UStream a try. After a great deal of testing, and providing the embed code to the Fischoff web developers, it came off without a hitch. All in all, a total of 1500 unique views (almost 3000 total), including a producer from NPR stating this was the best streaming video and audio he’s ever experienced. We even had one viewer (a grandmother of the Grand Prize winner), watching from France…how cool is that? YAY! 2) Ensure Analog In is selected on Canopus. 3) Login to UStream account. 5) Launch Cam Twist. * this is an application that tricks UStream into seeing an appropriate video source. 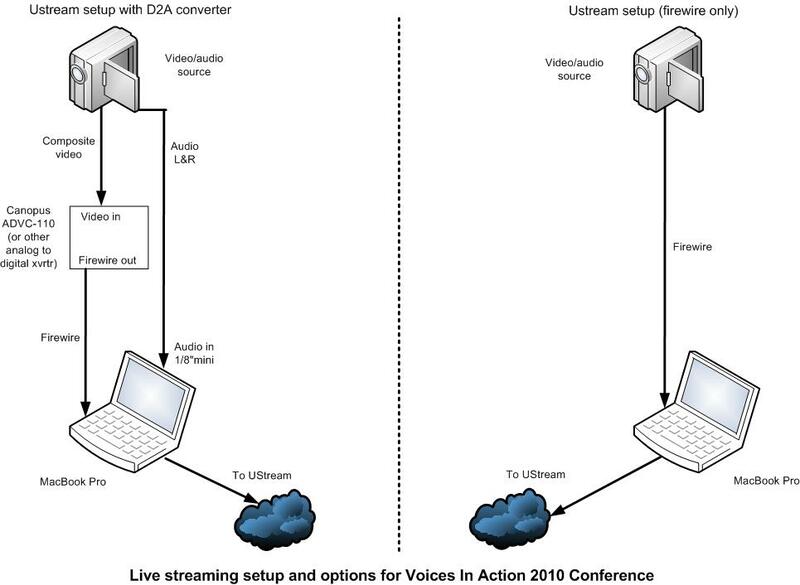 6) Select Webcam as video source in Step 1 or UStream DV source in the Saved Setups. 7) Settings column will populate with ADVC-110 (this is the Canopus). 8) Click Broadcast Now on UStream site. 9) Click Allow in Adobe Flash Settings. 10) Select CamTwist as the Video Source. 12) Select Build-in Input as the Audio Source. *a diagram will be forthcoming.